Book the private massage suite at this rain forest-inspired spa for an exotic treatment using hot river stones or bamboo shoots (standard Swedish is available too) and a customized signature facial. The whole lot comes with Champagne and a plate of chocolate-covered strawberries. V-Day at this midtown mainstay is all about chocolate: The package here features a sweet body, scalp, and foot rubdown on a rose-petal-strewn bed plus a purifying facial and mask, all using products derived from the cocoa plant. The package also comes with a goodie bag including candy kisses, a scented candle, and a two-ounce bottle of chocolate-infused body oil. This relatively budget-friendly package features a full-body aromatherapy massage for two, followed by a soak in side-by-side rose-petal baths with wine and a shoulder rub. Homme’s couples’ splurge starts with a Champagne-fueled soak in the Jacuzzi (the spa will give you up to an hour of candelit alone time). When you’re ready, phone downstairs for a massage (choose from Swedish, deep tissue, or Shiatsu). 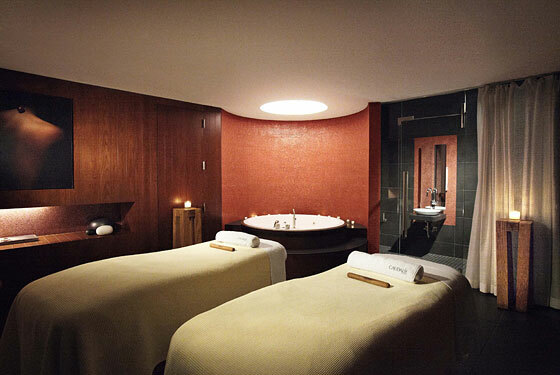 After side-by-side customized massages (Swedish, Deep Tissue, or Remedial) in a luxe private suite, Spa Chakra’s package includes a bottle of Champagne; we suggest bringing yours onto the heated roof deck overlooking Fifth Avenue or sipping it in one of their European-style soaking tubs. Leave with a complimentary $50 gift card for your next visit. Oenophile couples come here for a wine-enriched bubble bath with a scalp massage in one of Caudalie’s signature red barrel tubs. Then comes a facial that employs skin-brightening grape seeds, and finally a toning massage. Between treatments, head to the wine lounge for tastings and small bites with an on-site sommelier.